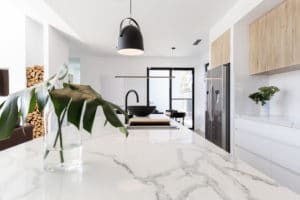 Home » Blog » Are Your Natural Stone Counter Tops a Mess? Let Advanced Stone & Tile Restorations Help! Every morning you get up out of bed and wander downstairs to grab a cup of coffee. Are you ashamed of what greets you in the kitchen? We’re not talking about the crumbs littering your table or the sink that’s still full of last night’s dishes. We’re talking about your natural stone countertops. Over time, the beautiful natural stone slabs have become scratched, scuffed, cracked, etched, chipped, and just worn down. Unfortunately, what was once the focal point of your kitchen has become an eyesore and now you cringe every time someone visits and strolls into your kitchen. Instead of grimacing every morning, why not let Advanced Stone and Tile Restorations help you reclaim your worn out natural stone counters? If you’re not sure how Advanced Stone and Tile Restorations can help, keep reading! No matter how careful you are, your natural stone surfaces will dull over time. This can be caused by normal wear or by etching from acidic liquids that come into contact with the countertops. Thankfully, Advanced Stone and Tile Restorations offers natural stone polishing services that go above and beyond the competition to get your countertops to look as good as new! A proactive step you can take to keep your natural stone countertops looking pristine is by getting them sealed. This should be done by a professional service such as Advanced Stone and Tile Restorations to ensure it is completed properly. We also have access to the right products to ensure a quality seal to keep your countertops sealed and protected. Something you might not have considered when it comes to improving the look of your natural stone countertops is a color enhancement. At Advanced Stone and Tile Restorations, we use color enhancers that include sealers and other impregnators to achieve the look you are interested in. Our products provide a consistent, long-lasting stain that reflects the exact style and color you would like. Plus, we thoroughly clean the stone first, so you can rid your counters of built up waxes or other polymers. If you are ready to reclaim those natural stone countertops, contact Advanced Stone and Tile Restorations today at (714) 917-5255! We have over years of experience and our professional team knows just what it takes to get your natural stone countertops looking like they did when they were first installed. Whether you need color enhancement, polishing, sealing or cleaning services for your natural stone in Southern California, Advanced Stone and Tile Restorations can help! To learn more about all of the quality stone and tile restoration services we offer, visit us on the web at Advanced Stone and Tile Restorations.